Chefs Bobby Flay, Damaris Phillips, Jet Tila, Jerome Grant and Geoffrey Zakarian share their top turkey tips, tricks and techniques for your best bird ever. All-star chefs Geoffrey Zakarian, Jet Tila, Damaris Phillips, Jerome Grant and Bobby Flay are in the TODAY studio to share their best tips, tricks and techniques to make the perfect turkey for Thanksgiving. They reveal how to spatchcock a turkey, revive an overcooked bird, cover it in bacon (because why not?!) and more. It is always tough if you forget to pull the turkey out of the freezer in time. No need to panic! You can always spatchcock the bird once it is thawed. By removing the backbone and flattening the turkey, it cuts the cooking time in half! You can also try separating the legs, thighs, wings and breasts and cooking them all separately if you're really in a rush. To spatchcock a turkey, turn turkey breast-side down and cut along either side of the backbone using kitchen shears to remove it. Then, turn the bird breast-side up and push on the breastbone until you hear a crack. Pull the thighs outward so turkey lies flat and tuck the wings. Brush with oil and season with salt and pepper. Roast at 450°F for about 1-1¼ hours, until thickest part of the thigh reaches 165°F. 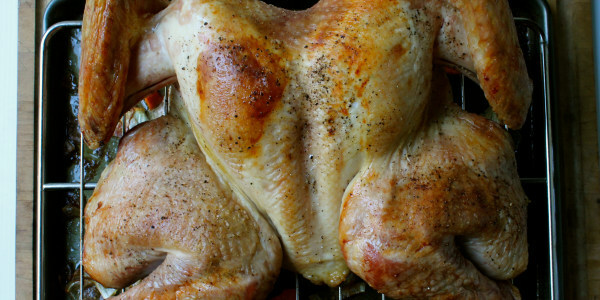 Rotate halfway through cooking and baste turkey twice. Let rest 20 minutes before carving. This easy technique lets you baste and cook the turkey at the same time! Killing two birds with one stone, so to speak. Soak a large piece of cheesecloth in a mixture of 3 parts melted butter and 1 part red wine. Drape the soaked cloth over the turkey and cook the turkey with the blanket of butter and wine. This will keep it moist and infuse flavor. The wine and butter keep it from developing burn spots and give it a gorgeous color. Remove the cloth 30 minutes prior to being done. Good gravy is one of the most important parts of the Thanksgiving meal. Don't worry if it doesn't turn out perfect at first — the savory sauce is surprisingly easy to fix. To thin out thick gravy: Add hot turkey stock (or water) to overly thick gravy and whisk to combine to thin it out. To thicken thin gravy: With the gravy still in the pot, over medium heat, add cornstarch (a little at a time) whisk until thickened to the desired consistency. To remove lumps: Simply strain the lumpy gravy through a fine-mesh sieve. Yes, you read that right. 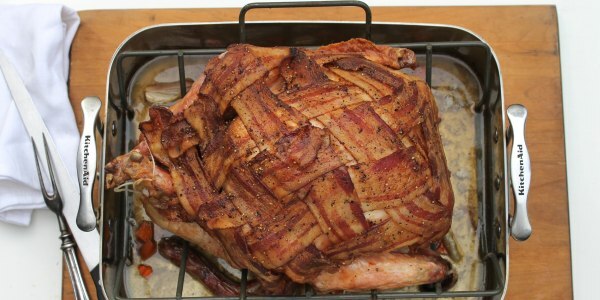 Wrap the whole turkey in bacon! Not only will the bacon provide incredible salty and smoky flavor, it will also keep the meat incredibly moist. Wrap all the exposed turkey skin with strips of bacon, making sure to cover the tips of the wings and legs as well. Tent the whole bird with foil to cook. Uncover at the end to crisp up the bacon. A perfectly cooked turkey should be removed from the oven when the breast registers 155°F and the leg 160°F on an instant-read thermometer. Unfortunately, with everything else going on Thanksgiving Day, things don't always go according to plan. If you have overcooked your turkey remove the pan from oven, loosely tent the bird with aluminum foil and let rest for 30 minutes before slicing. This resting will allow the juices to recirculate throughout the bird. Then, heat a pot of chicken or turkey stock and bring to a simmer. Slice the meat and put it on a platter and ladle some of the broth over the meat. The slices will absorb the broth and rehydrate. No one will ever know that it was overcooked.